This is the place of legends. Arthur Conan Doyle saw these rocks and promptly went home to write The Hound of the Baskervilles. 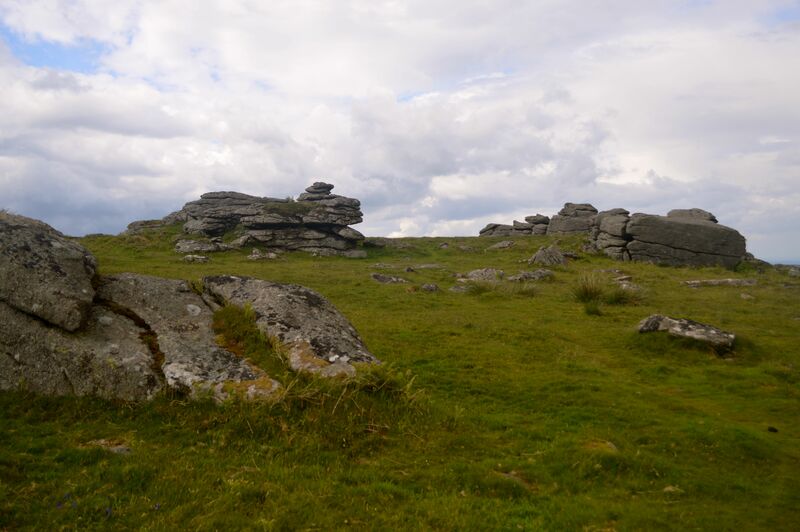 Our walk was five miles, beginning in the car park on the north side of Hound Tor. We were to end our day climbing up and over and between the rock outcrops, then down to the waiting Fiat. We walked past Bowerman’s Nose. The legend: A hunter, Bowerman, accidentally came upon a coven of witches performing their incantations. To silence him they turned him into a column of rock. He had seen the forbidden, like Lot’s Wife. He still stands on the Tor. If you listen, you may hear his cries for mercy…or is it the wind and the spell that the moors can bring upon the mind? We stopped and placed a flower on the lonely grave of Kitty Gray. It is a haunted place. Deemed a “whore”, she hanged herself and was buried in unconsecrated ground…at a cross roads. It is a haunted place…or is it the wind and the spell that the moors can bring upon the mind? We walked over pastures and wooded paths. I held the gate for two teenage girls who were out riding their horses. “Thank yew”, one said. We sat for a sip of water and an apple. There was a church steeple in a small village in a small valley. The bell was tolling. A wedding? A funeral? An Angelus? We passed by the ruins of a medieval village. Why did they chose this particular valley? Why did they abandon the site? Our legs became tired. There was a steep uphill path, a lane with a tall hedge row. I stopped to examine a flower. I brushed against a thorn of some kind. My thumb turned red and began throbbing. We came to the pass between the tors. “At the top we’ll see our car,” I said. My wife looked tired. We reached the height of ground…our car sat in the lot below. A small white Fiat. A place to change our shoes, sip our water and drive to the nearest pub. Legends and ghosts often have a tiny grain of truth buried within the story. Humans have walked these hills for well over a thousand years. No one can convince me that a seed from the distant past isn’t laying dormant under a lichen-covered stone…beneath the moss, the heather, the gorse and the years.